Wind energy development can potentially have environmental and economic benefits. Information about the potential benefits of wind power are listed below. Of which, approximately $4,770 will be distributed to the local public schools. Annual Water Savings: 1,840 million gallons. Creating payments to landowners for leases of ~$21 million annually. Geronimo Energy, LLC, the developer of a 400 MW wind farm under development in Holt County, Nebraska, compiled handouts identifying potential benefits. The Grande Prairie Community Fund is a 501(c)(3) organization, the purpose of which is to engage, assist, and contribute money (~$80,000/year) to support charitable activities. *Impact of Wind Energy on Property Taxes in Nebraska. Bluestem Energy Solutions & Baird Holm Attorneys at Law. 2013. 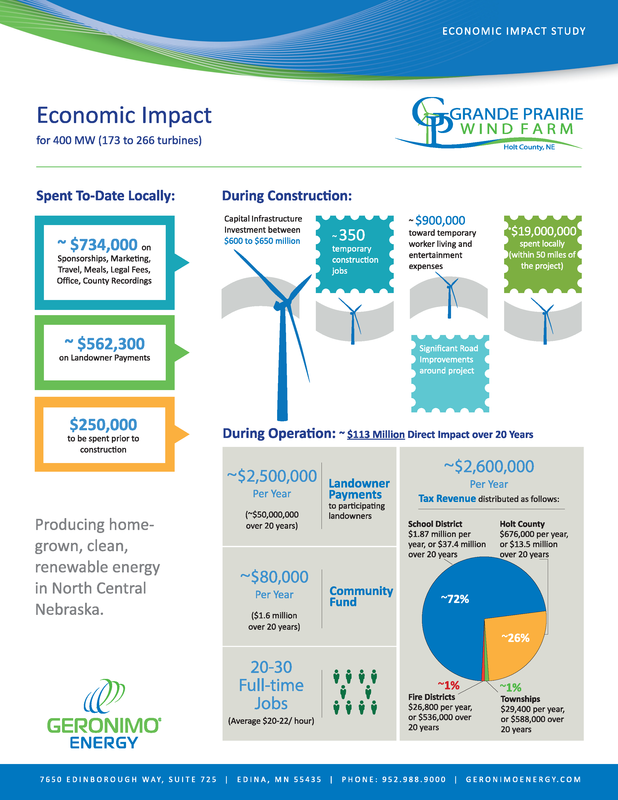 **Economic Benefits, Carbon Dioxide (CO2) Emissions Reductions, and Water Conservation Benefits from 1,000 Megawatts (MW) of New Wind Power in Nebraska. U.S. Department of Energy, Energy Efficiency and Renewable Energy. 2008. ***Renewable Energy and Economic Potential in Iowa, Kansas, Nebraska, South Dakota. Center for Rural Affairs. 2009.